I've made a quick little shaker card using the love arch die and punch. 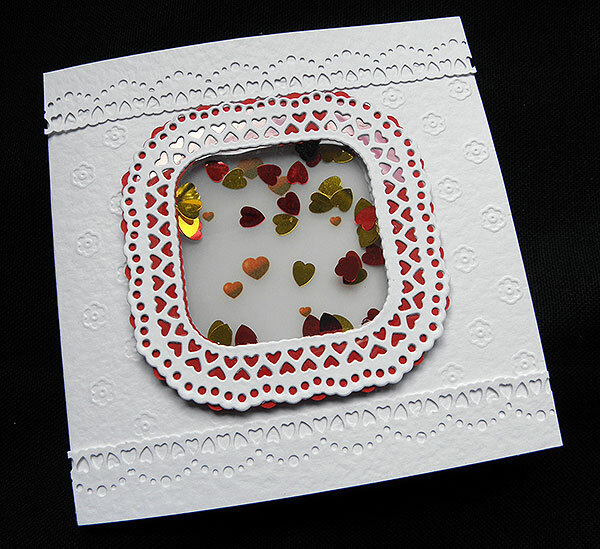 I have backed the window with a heart patterned vellum - this means that when the card is open, it gives a pretty translucent effect. It's always fun to include a bit of confetti inside your envelope too so that when your card is opened the recipient get's a little paper shower (or they get really annoyed with you for littering their floor) It's only 'cos you want them to understand what your floor looks like after you've made the card !! !